I read a range of different types of writing - classic literature to women's erotica to science fiction to biographies. I read paperbacks, ebooks, broadsheets, online tabloids (oh yes, I get sucked into the sidebar of shame on occasion! ), blogs, all sorts. I enjoy reading about people's lives, their dreams, their fears and their thoughts, and I enjoy reading that leads me to think, that inspires a reaction in me. But this morning I read a 'lifestyle' piece in the Guardian, written by Stuart Heritage, who styles himself as 'Man with a pram'. Through studying both English Literature and English Language at an advanced level I recognise the importance of considering the intended audience and aim of a piece - was it writen to provoke a response? Was it written to further an agenda, or to promote a product, or to share an experience? Now this piece is written by a father, a man who has written on his partners pregnancy, the birth of his son and his child's early days. This particular piece is about waiting for his child to smile. It speaks of anxiously reading parenting books, seeing other babies giggling and laughing, his worries whether his beloved child not cracking a first smile in the accepted 'normal age range' being indicative of autism, or psychopathy, or a future of serial killing. ...which I guess tells me all I need to know about just how highly he regards himself and his opinions, as well as an interesting note about how quickly he leapt to the need to defend himself from 'trolls'. There it is. His interpretation of a worst case scenario, of the ultimate failure of a parent, is to bring to this earth a "remedial-level dipshit". I tweeted him a photo of my remedial-level dipshit - I wanted him to see the face that his words referenced. I recognise that his article was a light hearted 'this is what being a parent is', oh look how we all worry about these things. It was not a serious thought piece about language or disability, or the impact language has on public understanding of, or attitude towards disability. This is exactly my point. 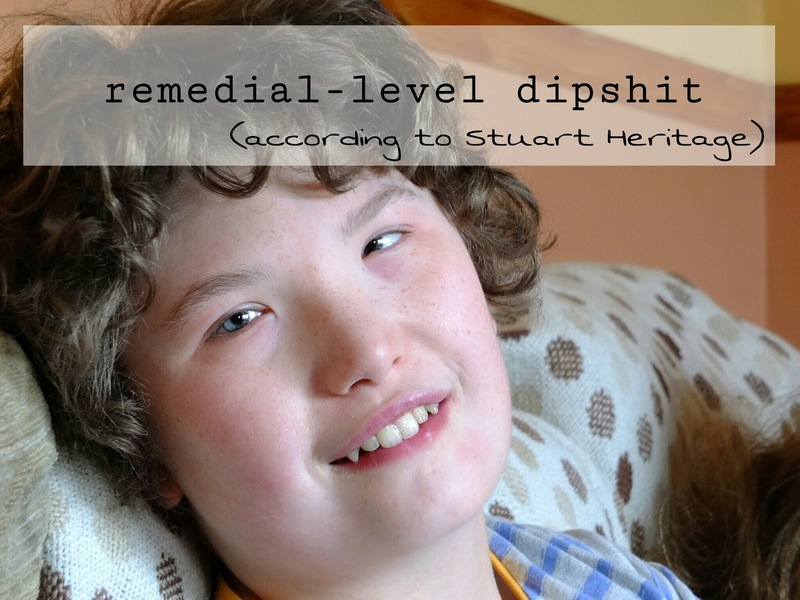 It is the careless use of language such as "remedial" that reinforces the negative image of individuals with learning disabilities - that they are useless, they have nothing to contribute, that their very existence is somehow evidence of a failure on the part of their parents. Would Stuart use these words about a family member do you think? If his precious baby had in fact had an intellectual impairment, would he still be able to make these jokes, to receive them in the mirthful manner he would no doubt maintain they were intended? I understand the concept of political correctness gone mad, the idea that people take offence at things that are not meant to be offensive, that this over sensitivity is pointless, and even, at times, faked simply to make a point. Which brings me back to the point about trolls. By disagreeing with something he'd said, commenting why they had an issue with it, a number of people were labelled as trolls by Stuart Heritage. Isn't that actually just a very lazy way of refusing to engage with a viewpoint other than your own, and instead castigate those who raise an issue with something you've said? Instead of trying to portray himself as a target of victimisation, perhaps Stuart Heritage might be better served by recognising that purely because he has a gorgeous (and now) smiling baby in his arms and feels that he can breathe a sigh of relief and gets to be a man with a pram occupied by an ordinary standard normal child, that doesn't give him the right to laugh at those who don't. 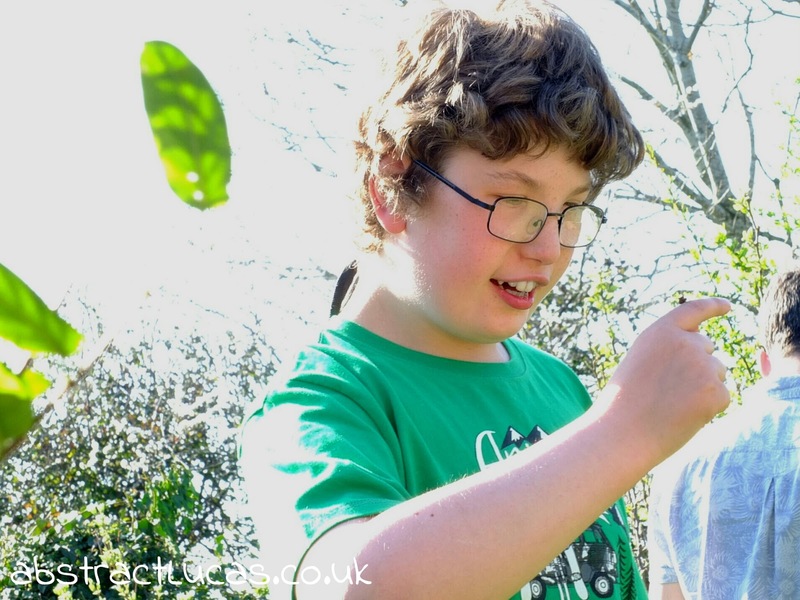 Those who instead find themselves pushing a wheelchair, using sign to communicate with their child, or who face the reality of losing their child altogether to a condition they can barely spell. I wish Stuart could find a way to rejoice in his child without feeling the need to compare him favourably to others, the way so many of us have done. I am so shocked people still use language like this in any context, let alone with such carelessness. Light hearted? Humourous? No thanks, it makes me feel very sick. Thank you Cate - I think the lightheartedness is part of the problem really - I don't think this was a though out expression of his attitude towards others, I imagine he's actually a relatively reasonable person - most of us are, after all! However the fact that he uses these phrases and doesn't appear aware of or at all sensitive to people finding them offensive or upsetting is confusing to me. I looked up the article and his Twitter feed and I totally agree with you - he is (at best) thoughtless and insensitive, and worst of all he doesn't apologise for getting it so wrong. He should put his hand up and say "Yes I made a mistake, I am sorry and here's how I plan to put it right in my next column" Instead he comes across as defensive and sorry for himself. And blocking you for your reasonable comment? Ridiculous. He needs to grow up. Hi Susan, thanks for joining in with the discussion. I agree - I don't think this was a purposeful dig but it's his refusal to engage that concerns me. To be honest, if he said "d'you know what, I didn't mean it the way it sounded but obviously this language has upset people, I'll try to be more aware in future" then I'd respect that, you know? And I really don't consider my tweet to him to be agressively, and I'm genuinely curious as to why he felt it was, but I am no longer blocked, so maybe he realised his reaction was daft? Interesting to see whether he comments at all in any medium about the reaction to his wording!